This post is written by the President and Founder of Deeper Still, Karen Ellison. Karen has a book that just came out called Healing the Hurt that Won’t Heal, Freedom for the Abortion-Wounded and Help for the Church They Fear. For the church to turn the tide on the culture of death, the theology of the sanctity of human life needs to be at the core of doctrinal orthodoxy. The sanctity of human life is not a fringe doctrine, or a specialized side issue to address once a year on Sanctity of Human Life Sunday. It is a part of basic Christian discipleship and service. This means the church needs to help us develop a mindset for the sanctity of human life. Dear pastor, we sincerely need to hear from you—but not just you—we need to hear from your elders, those gatekeepers who guard the orthodoxy and doctrines of the church. When they weigh in, it matters. 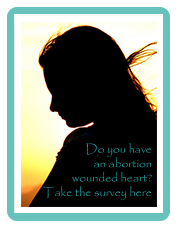 Are your youth pastors and your young adult pastors openly addressing the sanctity of human life and human sexuality? Are these truths and teachings permeating every sphere of your church culture? A disturbing segmenting has developed in the Church over the years. You have your Christians, and then you have your pro-life Christians. This ought not to be. Some are particularly gifted for and specifically called to certain pro-life outreaches, but as far as how we identify ourselves, what we teach, our discipleship models, and the ways we serve and give our finances, we should be weaving an open and life-affirming culture within the entire fabric of our faith community. If our spiritual leaders embrace these things, then we will begin to see women and men start to come out of the closet and trust you for help. It will start with a few, but when they gain their healing, then they will get their heart back and then their voice back, and once they get their voice, they will be able to expose the truth behind abortion and the lies that keep people bound. But when hearts are still bound by underlying guilt, shame, and grief, then much of their service is driven by performance and the need to prove something to you, God, themselves, and others. I am fully convinced and convicted that when abortion-wounded men and women who are Christ followers accept the Lord’s invitation to go deeper still in their journey to healing and lasting freedom, then we will see an army arise. This army will be made up of mighty warriors who can advocate for the lives of unborn children. But at present, that segment of the Bride of Christ considers itself unfit for the end-time church adventure. She believes that the glorious end-time in-gathering of the saints yet to be saved will be the inheritance of more worthy Christians. But I am confident that this soon and coming Bridegroom is fiercely committed not only to her redemption, but He will do anything to gain her affections and trust. He is coming for a bride without spot or wrinkle, and He will rescue her from the vicious pimp that stole her away and then enslaved her. When the Bride of Christ regains her identity and gets her voice back, she will become empowered to take up the charge for those who can’t speak for themselves. Right now, most of this army is like the living dead. This Bride needs shepherds who will recognize that she has been taken captive and enslaved by another master. She may be sitting in the pew every Sunday morning, and he may be serving as a Sunday morning greeter, but their sense of personal destiny and contribution in the things of God and His Kingdom are superficial. The Church in every generation has had its defining battles to fight and its causes to champion. In this 21st century, the sanctity of human life is surely one of these defining issues. If we lock arms, together we can prepare this Bride for her Bridegroom.